OMEGA Extended Blind Nut Blind / Bolt Anvil, ''C'' type driving tool. OMEGA Extended Blind Nut / Blind Bolt Anvil is manufactured with hardened tool steel making it a long-lasting and durable tool. OMEGA Extended Blind Nut / Blind Bolt Anvil is a component of the ''C'' Type Blind Nut Extended Driving Tool assembly for use with a Hi-Shear® HP Tooling BG1750 Hydraulic Power Gun. OMEGA Standard Anvil Heads are designed to seat against the shapes and diameter sizes of the sleeve heads of blind nuts and blind bolts. The OMEGA A35-832 Extended Blind Nut Blind Bolt Anvil is one of thousands of quality tooling products available from MRO Tools. 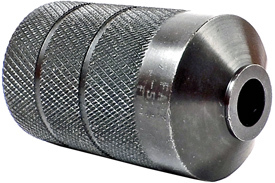 Please browse Blind Nut / Blind Bolt Anvils for tools similar to the OMEGA A35-832 Extended Blind Nut Blind Bolt Anvil. OMEGA A35-832 Extended Blind Nut Blind Bolt Anvil description summary: OMEGA Blind nut / blind bolt anvil, extended length, ''C'' type driving tool. C Diameter: .41 M Diameter: .166 Quantity discounts may be available for the OMEGA A35-832 Extended Blind Nut Blind Bolt Anvil. Please contact MRO Tools for details.